Eli has always wanted to be on the water. When he was younger, his dad took him out. As he got older, he ventured out on his own with friends. Most teenagers are obsessed with high speeds. But not Eli, although he’s very good on a jet ski. He prefers the calmer, quieter ride of a paddle board. 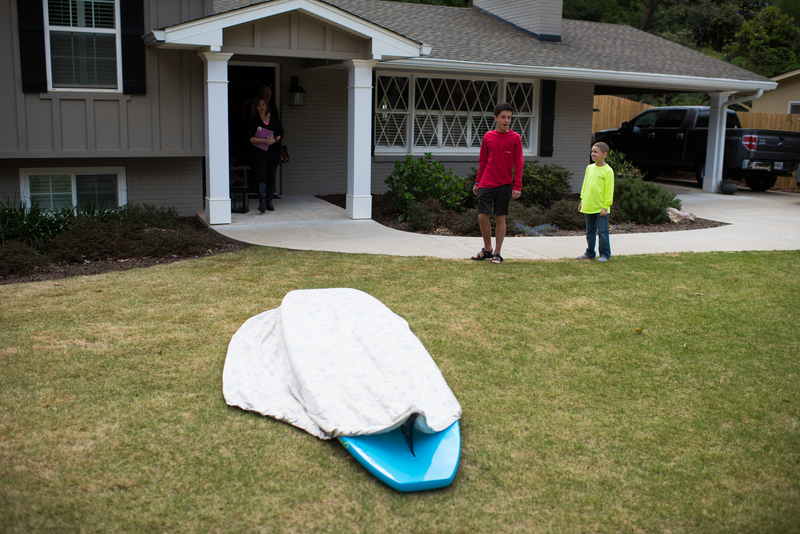 It’s kind of like a kayak, but the board is flat and you stand up on it. Eli says it’s relaxing. And given what’s happened to him this last year, Eli needs all the relaxing he can get. It took doctors awhile to figure out what was behind his constant headaches. 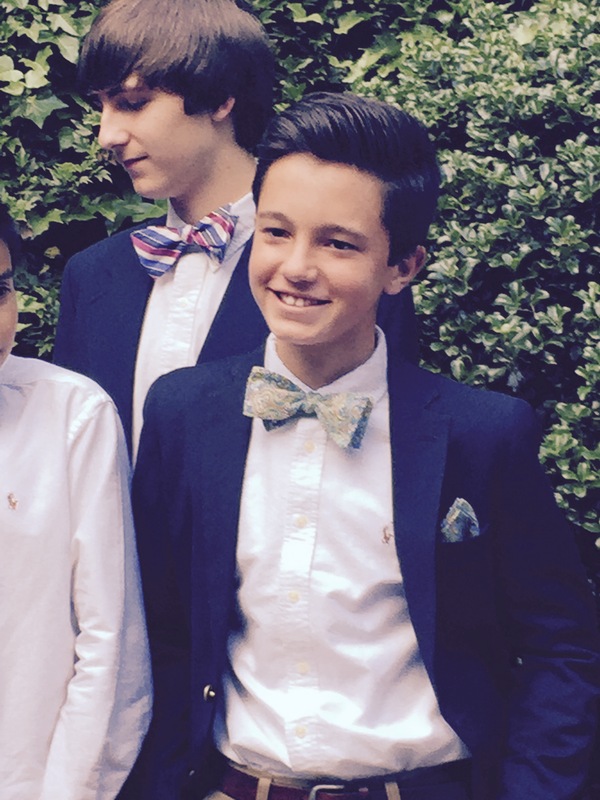 When they finally did figure it out, the news stunned everyone: nasopharyngeal carcinoma – an extremely rare form of cancer in the nose and throat…so rare that Eli had the distinction of being the only teenager in the country diagnosed with that disease at stage 4. Eli had to drop out of the 7th grade a year ago last March and be home schooled for the rest of the school year. And what should have been a fun summer out on the water was instead months of chemotherapy and radiation. Unable to eat, Eli had to have a feeding tube and dropped down to just 92 lbs. 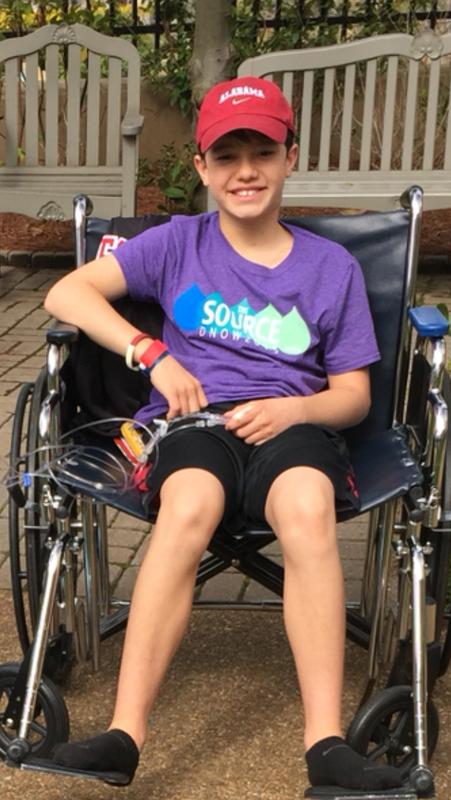 One day when Eli was getting a chemotherapy infusion at the clinic, he met a 7-year-old boy a few chairs down who was getting an infusion too. They really did not say much that day, but they did figure out that they were from the same town in Georgia. Guess who the 7-year-old was? Our very own Team Summer kid Chandler! Except he wasn’t a Team Summer kid YET. A few months later, Team Summer kid Addi gave him his very own puppy! Then it was Chandler’s turn to give a gift, and he remembered the older boy from the clinic. He could not wait to surprise him! After practicing until he had it perfect, Chandler carefully read Eli the Team Summer letter. Then it was time to take him to his gift. Here’s a hint: we could NOT hide it in the house. 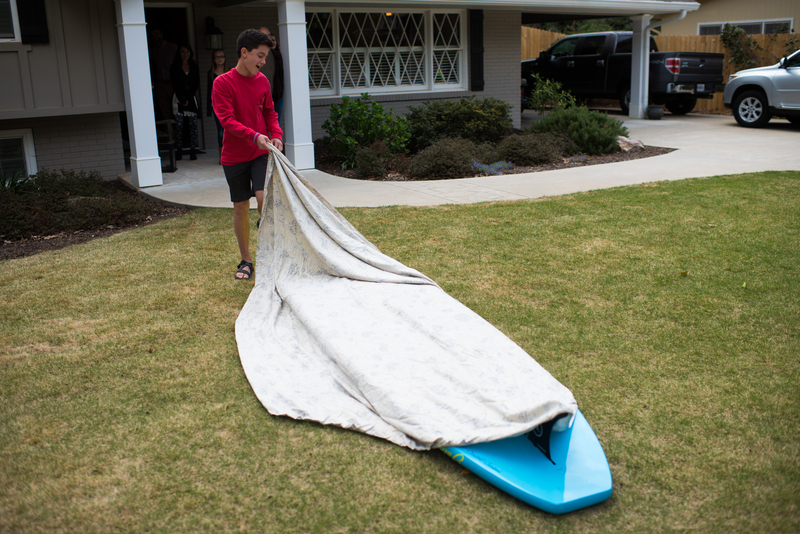 In fact, even the big tarp we brought did not quite cover it! But Eli knew exactly what it was just from the shape! 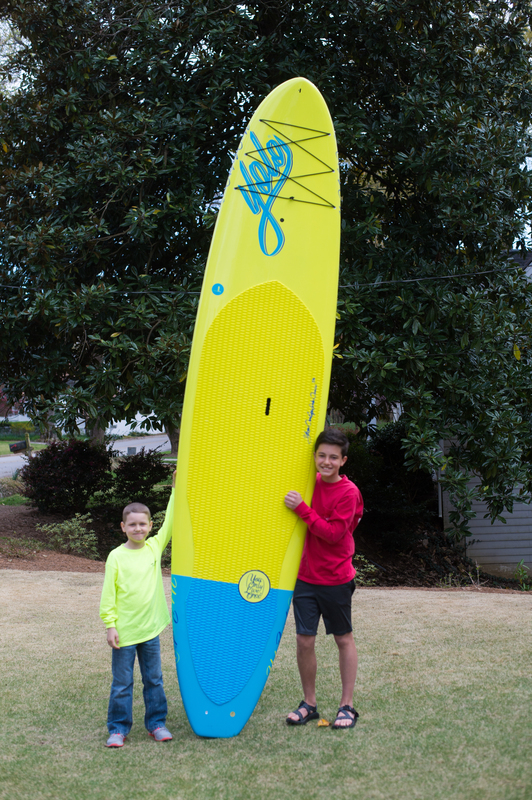 The paddle board of his dreams – a YOLOBoard! YOLO stands for “You Only Live Once (Make it Count),” and Eli says that is his personal philosophy. Up til now, Eli had always had to rent a paddle board. Now, he had one of his very own! Chandler handed him the paddle. Eli seemed so excited we thought he might paddle away right then and there! 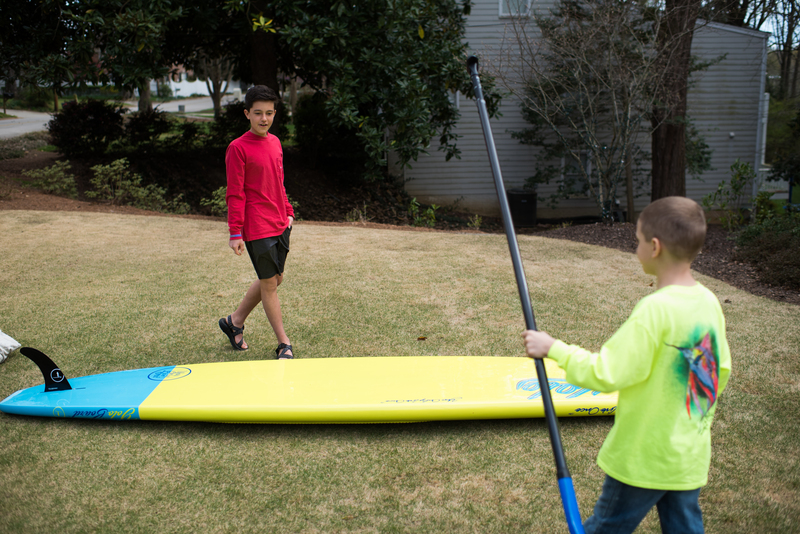 Eli spent a little time explaining the finer points of paddle boarding to Chandler, and a new fan was born! And if you were wondering how tall these things are, here’s a little perspective! Geez Louise! The best news of all is that Eli recently got his feeding tube out and can go out on the water again. 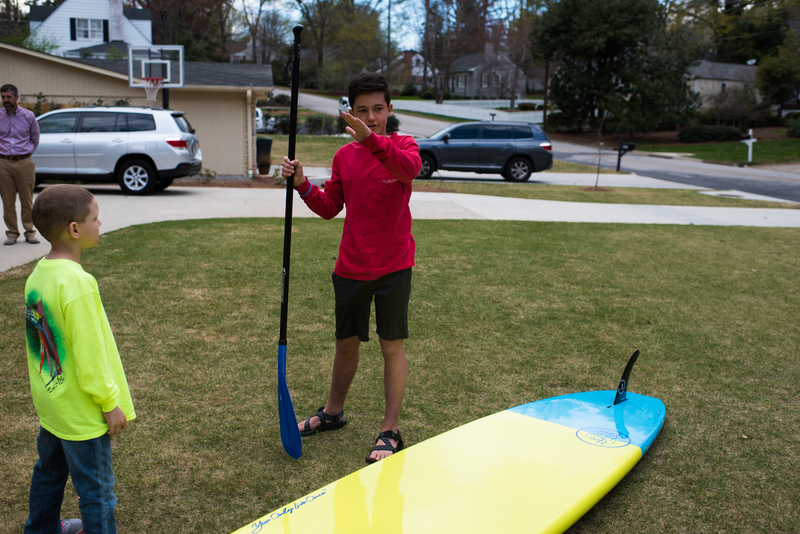 Eli is BACK, happily paddling around this summer on his YOLOBoard! All gifts are made possible only through your donations! Thank you for your support! Yes, Eli is such a thoughtful young man. 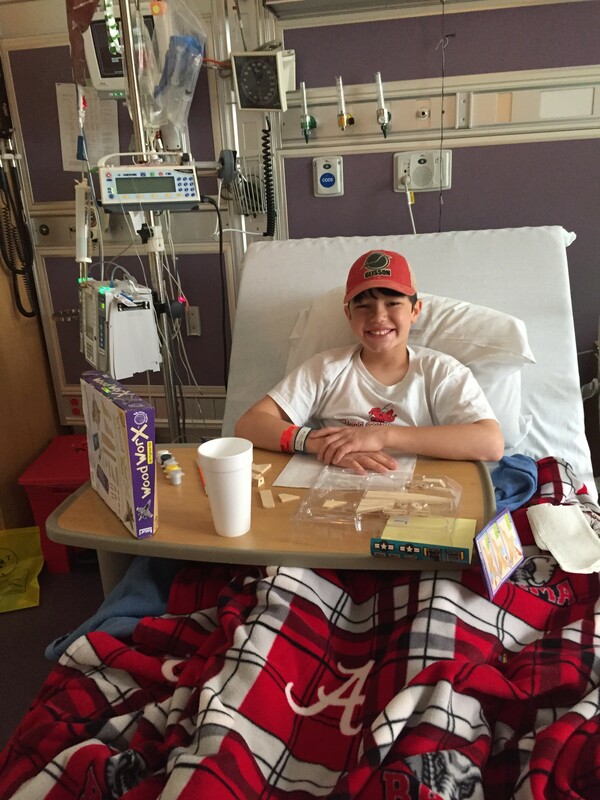 Jack was diagnosed with the same rare cancer as Eli but after the biopsy it turned out to be B-Cell Lymphoma. None the less not anything we wanted to hear. When I met Eli and his mother we were already down at CHOA. So many questions and an overwhelming amount of fear. I can’t express how thankful I am for the chance to be involved now. His gift suited him and I can’t wait to see all the pictures to come! Thanks Carol Ann and Eli for making Jack’s road to remission much more tolerable.